The impressively versatile Pro Club Lat Machine is a favorite of gym and fitness club patrons. The machine has extraordinary capabilities which set it apart from the competition and make it a very popular piece of equipment indeed. You get a high pulley directly overhead for optimum back and shoulder isolation, and the extra long pull-down bar allows you to choose a wide, medium or narrow hand-grip position for maximum development. The ‘no cable change’ design enables the user to immediately go to a Long Pull / Seated Row exercise movement to further increase size, strength, and endurance of the back muscles. The inclusion of adjustable hold down pads stabilize you and conveniently allow for lifts beyond your body weight if desired. 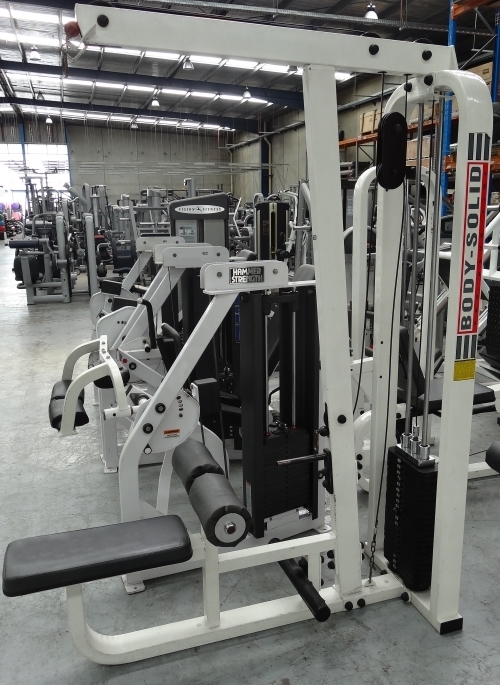 The machines’s unique styling, space efficient design, exceptional performance, and versatility make it a standout addition to any gym, club or institution. Pulleys: Fibreglass reinforced nylon pulleys with v-grooved channels. Lat Mid Row for sale, feel free to enquire above.